Iran has been a theocracy since Ayatollah Khomeini returned to his homeland in 1979 and replaced the monarchy of Shah Reza Pahlavi. "Only when our peace partners are willing to recognize the legitimacy of the Jewish state," Israeli Prime Minister Netanyahu said recently, "will they truly be prepared to end the conflict and make a lasting peace with Israel." 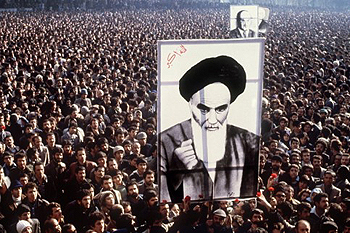 Theocratic statehood, however, is a cause of the region's conflicts. Nothing exemplifies this more than the discord between the theocracies of Iran and Israel. Radicalized militias, bilateral arrangements and defense assistance all bear some form of allegiance to the divide. At the international level the political codification of faith within the state system has proved increasingly problematic. It could be denying systemic strength to realize a two-state solution between Israelis and Palestinians. As with other Middle Eastern conflicts, the regional framework of political accord is becoming vital to overcome them. Currently there is no such effective regional framework in the Middle East. The Gulf Co-operation Council; Arab League; and the Non Aligned Movement all have different agendas and different membership, none of which have been able to systemize accord with the region's two theocratic states, nor engender the political mechanisms for the two-state solution between Israel and Palestinians. The Arab League, for example, which comprises most states in the Middle East including Palestine, is designed to foster cultural and economic integration within the region, yet still expelled Egypt after Egypt signed a peace agreement with Israel. The Non Aligned Movement seems to have evolved into a similar format, with the primary coalescing mechanism being to resist superpower intervention in the region, notably of the United States in respect of Iranian nuclear technology. Israel, of course, is not part of any of these regional bodies. Instead of open progressive interaction between the region's states,intelligence networks and war zones are manifest. A political void seems to exist filled with strategic alliances, sectarianism and theocratic divisions, a void that all manner of current associations have been unable to bridge with the legislative authority of the entire international state system. For these reasons the political affiliation of the Israeli state within open Middle Eastern multilateral systems could be more essential than its Judaic recognition. The Middle East, after all, is where theocracies continually overrule U.N. resolutions. Between 1955 and 2009, Israel resisted 101 of them. With Iran they now amount to sanctions, resolution 1929 being the latest. Has Iran complied? Doesn't look like it. Along with the proliferation of intelligence networks in the region, the non-compliance with U.N. resolutions could also undermine the United Nation's aggregated authority. The question is, does the discord also affect theocratic validity? Political noncompliance, especially of the Iranian and Israeli theocracies to U.N. resolutions, suggests so. The universal direction of monotheism engendered within the faith system seems foregone by their unilateral defiance against globally aggregated authority. And it doesn't look like it's going to reoccur through theocratic statehood. Not after centuries of religious conflicts. Obeisance to the said faith of the state hasn't led to cohesive political accord. The Iranian Green Movement's resistance, for instance, to the clerical regime's re-election in 2009 was loud and clear and suppressed by a government incapable of resolving Iranian regional discord. Transcending the interfaith divide is the challenge. Transforming Israeli and Palestinian protagonists into "partners for peace" could take political mechanisms devoid of a faith specification. With state resources and global security issues today, no one state can unilaterally resolve them. Nor can the state be independently secure, regardless of their defense and faith system. According to the Australian Strategic Policy Institute's Anthony Bergin, last year there were 828 weather catastrophes involving death and economic damage globally, compared with 317 in 1980. In his "A New Paradigm for Gulf Security," Abd al-Jahl al-Marhoun notes, "There are eight countries that reside on the shores of the Arabian Gulf. … Before defining the nature of the proposed coordinated security system in the Arabian Gulf and its possible applications on the ground, it is essential clearly to state that such a system must be integrated within a geopolitical framework that extends beyond the Gulf region. Yemen, India and Pakistan ought to be included." Even so, the Middle Eastern geopolitical framework embodies more than the Arabian Sea and its Persian Gulf. What about Israel, Jordan, Egypt, the Lebanon and Palestine? And did Syria and Afghanistan fall off the map? It's the same on the international level. Geo-strategic reasoning by major powers apparently predominates over moves towards regional cohesion when it comes to the Middle East. Counteracting India's authority in Afghanistan, for example, is rendering Pakistan's role in the Taliban reconciliation process more than simply questionable. The rationale is contingent. Within the state itself, sectarian discord has precluded the state's ability to form strong representative governments, thereby validating defense initiatives of major players. Military dictatorships are prevalent. From Iraq to Afghanistan, Pakistan, Iran and Israel, governments still justify militarily and are mandated via state defense rather than by way of representative accountability, none of which theocracies have overcome. Theocracies are the most militant systems in the Middle East. The contingent nature of the discourse driving these conflicts suggests a resolve would be extensive. For the Palestinians it could take collective security arrangements comprising the entire Middle Eastern geopolitical region to systemize accord and transform the animus beyond just recognition of the Judaic state of Israel. Laurelle Atkinson is a geopolitical analyst in Australia.